Day 3: I bumped into Jim Morrison. His body guard says hello. I had planned to visit either Chantilly or Fontainebleu today, but had to abort when I realized that both were closed (the chateaux, not the parks themselves) on Tuesdays. By the time I had figured out where the platform was and had bought the tickets, it was noon, and I was at a bit of a loss for what to do instead. Keep in mind that on Tuesdays, most museums are, apparently, closed. However, I remembered that the Cimitiere Pere Lachaise was not only open all day, but also free. It is one of the most cemetaries in the world and contains roughly one million graves. It seemed to me that it was nearly as big as some of the major gardens or parks in Vancouver, such as Van Deusen Gardens, but maybe I was just overwhelmed at the time. After seeing the Bastille, I walked up Rue du Chemin Vert towards Pere Lachaise. It was quite a long walk, at least an hour long, but I got a look at a side of Paris I'm sure most tourists don't see. The apartment buildings here look like they were thrown up rapidly, without the attention to style of the ones in the trendy tourist areas. There is a lot of graffiti, and there are a lot of people hanging around. On the other hand, it's more colourful than I've found the tourist areas, with a much more diverse and interesting population. There look to be many delicious ethnic restaurants in this area, too. 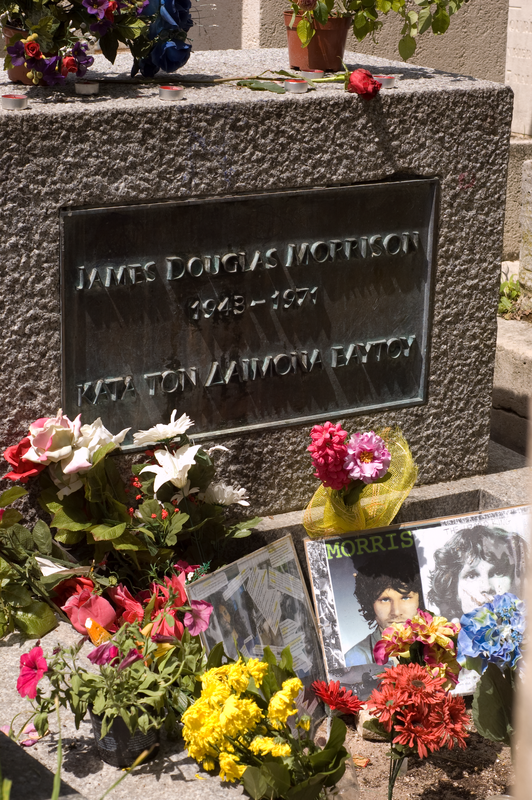 Once at the cemetery, I used the Rough Guide map to find Oscar Wilde, Edith Piaf, Rossini, Colette, and of course Jim Morrison. There is a lot to be said here for the Rough Guide's accuracy; they suggest buying a more detailed map but it really wasn't necessary. In fact, their description of Jim Morrison's grave as having a lot of groupies hanging around smoking and a body guard to fend them off from the grave was spot on! When I got there there were indeed a handful of people sitting on the ground gazing at his tombstone while smoking (something). There was a body guard who stopped people from hanging over the guardrail they had to put up to keep people off his and his neighbours' graves. 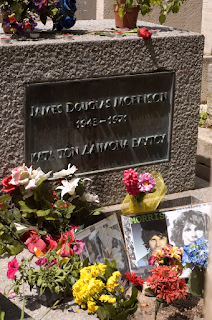 Jim Morrison's grave in Pere Lachaise cemetary. The graves themselves are impressive - many contain huge stone monuments and carvings, plants and even trees. Some have stained glass windows. 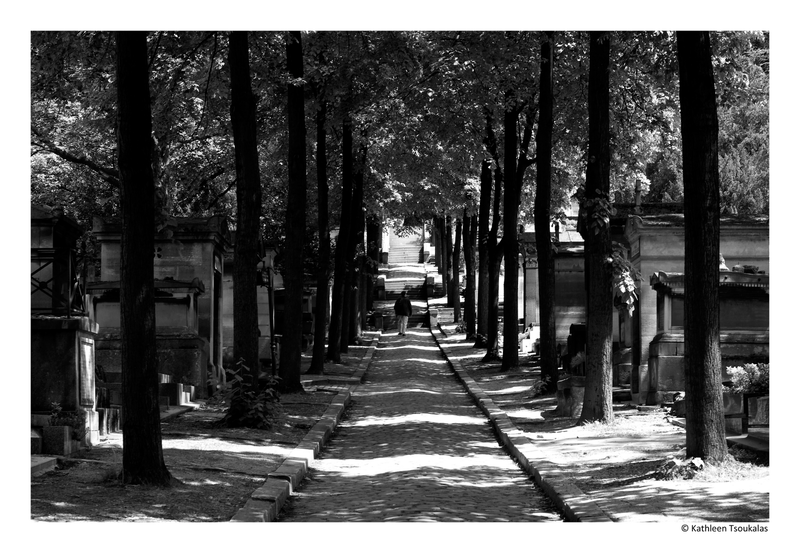 The cemetery is lined with large, leafy trees and has cobblestone walkways. One thing the guide book doesn't mention is the numerous bugs and other insects you sometimes have to swat your way through. There are also several cats, I guess for catching mice. Unfortunately the cobblestones make walking very tiring and after what must have been at least two hours, I headed home, exhausted. 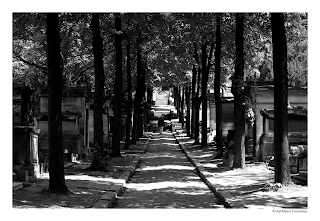 Walking down the tree-lined paths in Pere Lachaise. 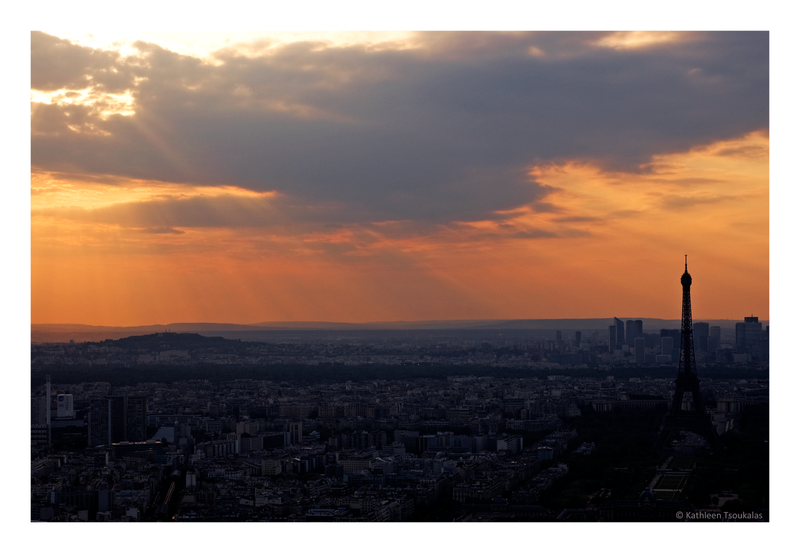 In the evening I went to Tour de Montparnasse to watch the sunset from the 56th floor. This is a really good deal, 11 euros, no wait, and a beautiful open air terrace at the top with 360 degree views. Except for the screaming teenagers, it was really nice! I had dinner there too and it was very cheap and delicious. The sunset was spectacular. Highly recommend going here if you get the chance! Sunset from atop the Tour Montparnasse.